* The Taylor Camp was chartered in 1971. But as late as 1994 only had 25 members. Now we stand at about 170 members.The Taylor camp is the largest in the Louisiana Division, and the oldest existing Camp in North Louisiana. But more than that, it is very active in carrying out the Charge of S.D. Lee. The Taylor Camp has been in the front line of all Heritage fights in their area and indeed the state. We are out in the public almost every weekend promoting our heritage, whether in parades, doing living histories or having booths at local festivals. The Taylor Camp has had a booth every year for the entire two weeks at the La State Fair for four years in a row. It is estimated that about seven thousand people have contact with us there every year. *Past Taylor Camp Commander Paul Gramling was elected ATM Commander for 2000-2001. Taylor Camp Past Cmdr. Chuck McMichael was awarded the Gov. Thomas O Moore award for service above and beyond the call of duty and in 2002 the Robert E Lee Medal. He also served as the Genealogist for the SCV, National Chief of Staff and in 2004 was elected Commander of the La Div. At the 2000 Division Reunion, Adjutant Robert Barnard was awarded the Outstanding Compatriot of the NW Brigade Award. In 2004 Compatriot Will Mason was awarded this honor. Past Commander Paul Gramling now served as the National Chief of Heritage Defense.He has also served as LA Division Commnander. Compatriot Ben Head served as the Commander of the NW Brigade and Compatriot Roger Anderson served as the Louisiana Division Adjutant from 2004-2006. In 2006 Chuck McMichael was elected ATM Councilman.2006 David Hill was presented the Outstanding Compatriot Award for the NW Brigade.In 2007 Adjutant Scott Summers was presented the Outstanding Compatriot Award for the NW Brigade. 2008 Bobby Herring was presented the Outstanding Compatriot Award for the NW Brigade.In 2007 Paul Gramling recieved the Divisions highest award,the Thomas O. Moore Award as well as the Robert E Lee Gold Medal. Commander David Hill and Compatriot Wilber Snellings have both recieved the National Graves Award. In 2008 David Hill was elected 2nd Lt Cmdr of the LA Div and Scott Summers became Div Adjutant. Paul Gramling was elected ATM Councilman and Chuck McMichael was elected Commander in Chief. 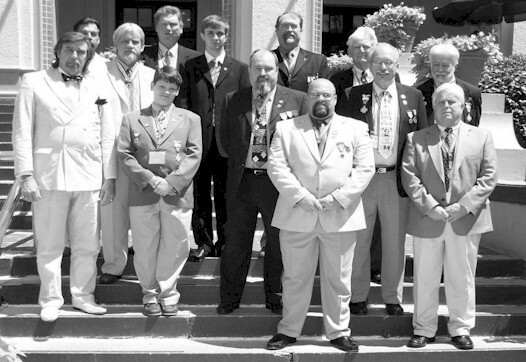 In 2009 Chuck McMichael was awarded the Jefferson Davis Chalice, the SCV's highest award. In 2010 David Hill was elected La Div Commander. In 2014 Paul Gramling was elected ATM Councilman and JC Hanna was elected 2nd Lt Commander of the La Div. *But these accomplishments are all now past, the Taylor camp is committed in the future to work even harder to see that our Confederate Heritage attains all the proper respect due it!! !